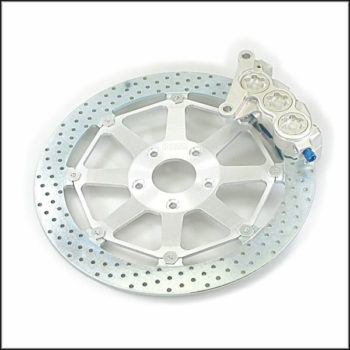 Unparalleled stopping power is the only way to describe what this ISR Brake kit offers. Kit comes complete with race designed 6 piston “pocket” caliper, brake pads and 320mm light weight semi floating brake rotor. Direct bolt on for ’84 to ’99 HD, available left and right hand. Accepts 10 x 1.25 mm Banjo Bolt. We recommend a 17.5 mm Master Cylinder for a dual front brake setup and a 14 mm Master Cylinder for single caliper use. All ISR brakes use only DOT 4 brake fluid. Add our Specially Priced Banjo Bolt Kit (includes 1 ISR Stainless Steel 10×1.25mm Banjo Bolt and 2 10mm Sealing Washers) now and save the extra cost of shipping.